There has been silence from the ‘progressive’ pan-nationalist coalition after it was revealed that Sinn Fein’s Chris Hazzard MP, a self-proclaimed advocate for victims, had moved into a terror den within his South Down constituency. Chris Hazzard’s new IRA terror den makes a mockery of his pretence that he is some kind of advocate for victims. Mr Hazard is an advocate of victims that fit the IRA’s narrative of the conflict, in other words he uses victims for his own political purposes. Earlier in the week the SDLP, supported by liberal trolls, had launched a venomous campaign against unionist MP Emma Little-Pengelly in an attempt to force her to marginalise sections of the unionist community. This is even more astonishing given the leader of the SDLP has been pictured carrying a coffin at a terror funeral and that their party brought us the ‘Raymond McCreesh’ play park. Named in ‘honour’ of one of the most ruthless and sectarian mass murderers in Northern Ireland history. The contrived anger stemmed from the fact that Ms Little-Pengelly had held an advice centre in a local band hall. With clearly obvious sectarian undertones the SDLP launched a campaign of vilification against the band hall itself, and the unionist MP. It seems that the ‘progressive’ pan-nationalist coalition are working in unison to target all shades of unionism. There is no equivalence between the cultural expression of a unionist band hall with an IRA terror den masquerading as an ‘advice centre’. 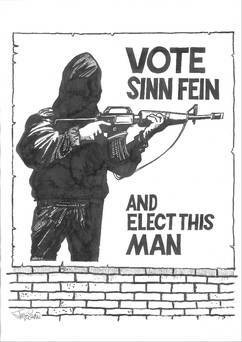 Let us remember the type of ‘advice’ Sinn Fein used to dish out in their ‘community surgeries’. Those summoned to attend would usually end up needing surgery after being set up by an IRA gang! The Alliance party already displayed their sheer intolerance, with very clear sectarian undertones, by virtue of their hysterical reaction that the Northern Ireland Affairs Committee would dare to hear a grassroots unionist viewpoint. Many unionists have watched in amazement over the past week at how the ‘progressive’ pan-nationalist coalition of Sinn Fein, SDLP and Alliance have completely lost their minds following unionism’s failure to surrender to the political demands of Sinn Fein, which are being dictated by the still active IRA Army Council. After Naomi Long’s raving outbursts on last week’s Nolan show, it was followed up this week by an incandescent Kellie Armstrong, who re-iterated her demand that unionism must surrender to all of Sinn Fein’s political demands. Many unionists will see very clearly the increasingly co-ordinated nature of the ‘progressive’ pan-nationalist coalition, which has seen the Sinn Fein-Alliance-SDLP cabal act as an axis of hate towards unionism. 350 Responses to "NEWS: SDLP and Alliance silent on Hazzard’s terror den"
The very core of your writing whilst sounding reasonable originally, did not settle perfectly with me after some time. Somewhere throughout the paragraphs you managed to make me a believer unfortunately only for a short while. I still have got a problem with your leaps in logic and one might do nicely to fill in those breaks. In the event that you actually can accomplish that, I could certainly end up being fascinated. Just desire to say your article is as astonishing. The clarity in your post is simply cool and i can assume you are an expert on this subject. Well with your permission let me to grab your RSS feed to keep up to date with forthcoming post. Thanks a million and please carry on the rewarding work. When I originally commented I clicked the -Notify me when new comments are added- checkbox and now each time a comment is added I get four emails with the identical comment. Is there any means you possibly can take away me from that service? Thanks! fast! What web host are you using? Can I am getting your associate hyperlink in your host? I was more than happy to seek out this internet-site.I wished to thanks in your time for this glorious learn!! I undoubtedly having fun with every little bit of it and I have you bookmarked to take a look at new stuff you weblog post. The very core of your writing while appearing agreeable in the beginning, did not really work well with me personally after some time. Somewhere within the paragraphs you actually were able to make me a believer but only for a short while. I nevertheless have a problem with your jumps in logic and you might do nicely to help fill in those breaks. In the event that you can accomplish that, I could undoubtedly be fascinated. I’d have to check with you here. Which is not one thing I normally do! I get pleasure from reading a put up that may make individuals think. Additionally, thanks for allowing me to comment! Thanks – Enjoyed this article, can you make it so I receive an email sent to me every time you publish a fresh update? Hello, Neat post. There is an issue along with your site in web explorer, might check this… IE nonetheless is the marketplace leader and a large part of folks will leave out your magnificent writing because of this problem. Can I simply say what a relief to seek out someone who really is aware of what theyre speaking about on the internet. You positively know the best way to convey a difficulty to gentle and make it important. Extra individuals must read this and understand this aspect of the story. I cant believe youre not more common because you positively have the gift. I want to convey my appreciation for your generosity in support of folks who require assistance with that content. Your real commitment to passing the message all over has been wonderfully practical and has surely enabled most people like me to achieve their goals. Your new important guide indicates a whole lot to me and still more to my office workers. Many thanks; from all of us. Hello, I check your blogs daily. Your story-telling style is awesome, keep doing what you’re doing! We’re a group of volunteers and starting a brand new scheme in our community. Your website offered us with helpful info to work on. You’ve done a formidable process and our whole group shall be grateful to you. I and my pals appeared to be looking through the great points on your site and so all of a sudden I got an awful feeling I never expressed respect to the web site owner for those tips. My ladies are actually for that reason stimulated to see them and have now extremely been enjoying those things. Thank you for genuinely well helpful and then for making a decision on this sort of superb ideas most people are really desirous to know about. My honest regret for not expressing gratitude to earlier. Wonderful post however , I was wondering if you could write a litte more on this subject? I’d be very grateful if you could elaborate a little bit more. Thanks! Thanks for finally writing about >NEWS: SDLP and Alliance silent on Hazzards terror den | Unionist Voice <Loved it! A large percentage of of the things you say is supprisingly legitimate and that makes me ponder why I hadn’t looked at this with this light before. Your article truly did switch the light on for me personally as far as this issue goes. Nevertheless at this time there is actually 1 factor I am not too comfortable with and whilst I attempt to reconcile that with the core theme of your position, permit me observe exactly what all the rest of your readers have to say.Nicely done. Do you have a spam issue on this site; I also am a blogger, and I was wondering your situation; we have created some nice practices and we are looking to exchange solutions with other folks, be sure to shoot me an e-mail if interested. Hi would you mind letting me know which webhost you’re working with? I’ve loaded your blog in 3 different internet browsers and I must say this blog loads a lot faster then most. Can you recommend a good web hosting provider at a fair price? Many thanks, I appreciate it! Hi there, You’ve done a fantastic job. I will definitely digg it and personally recommend to my friends. I am sure they will be benefited from this site. Hey There. I discovered your weblog the use of msn. That is a very smartly written article. I will make sure to bookmark it and come back to learn extra of your helpful info. Thank you for the post. I will definitely comeback. It’s actually a nice and helpful piece of info. I’m happy that you just shared this useful information with us. Please keep us informed like this. Thanks for sharing. mind before writing. I have had trouble clearing my mind in getting my ideas out. learn this post and if I may I want to recommend you few attention-grabbing things or suggestions. a shout out from Atascocita Tx! Just wanted to mention keep up the fantastic job! contains plenty of useful information, thanks for providing these information. structure to your blog. Is this a paid subject or did you modify it yourself? stumbleupon on a daily basis. It will always be helpful to read content from other writers and use a little something from other websites. fresh to the blogosphere. Short but very accurate info… Appreciate your sharing this one. day. It’s always exciting to read articles from other writers and practice something from their web sites. for the reason that this this site conations actually pleasant funny stuff too. i am just following you. Look forward to checking out your web page yet again. Thanks for another excellent article. Where else may just anyone get that kind of information in such an ideal method of writing? The clarity on your post is simply nice and i can think you are an expert in this subject. I’m very pleased to discover this page. I want to to thank you for your time for this fantastic read!! Hi there friends, fastidious piece of writing and fastidious urging commented here, I am really enjoying by these. feels that you’re doing any unique trick. Moreover, The contents are masterpiece. my very own blog and want to find out where you got this from or just what the theme is named. also with the layout on your weblog. Is this a paid topic or did you modify it yourself? to your blog? My blog site is in the very same niche as yours and my visitors would genuinely benefit from some of the information you provide here. site is genuinely fastidious and the users are actually sharing fastidious thoughts. permit me know in order that I may subscribe. Thanks. masterpiece. you have performed a fantastic task in this matter! Attractive part of content. I simply stumbled upon your site and in accession capital to say that I get in fact enjoyed account your weblog posts. Any way I will be subscribing to your feeds or even I achievement you get admission to constantly quickly. at this website, and post is actually fruitful in favor of me, keep up posting such articles. should be shared around the web. Disgrace on Google for no longer positioning this put up upper! solid, but what if you added a title that makes people want more? is a little boring. You ought to glance at Yahoo’s home page and see how they create article titles to grab viewers interested. grab people interested about what you’ve written. In my opinion, it might make your posts a little bit more interesting. The clearness for your post is simply cool and i could think you’re an expert in this subject. Excellent way of describing, and fastidious piece of writing to get data regarding my presentation subject, which i am going to convey in institution of higher education. to forward this post to him. Pretty sure he’s going to have a very good read. performed a formidable process and our whole neighborhood will probably be grateful to you. subject, made me for my part imagine it from so many varied angles. has been discussed for a long time. Wonderful stuff, just wonderful! personally will need to…HaHa). You definitely put a brand new spin on a subject which has been discussed for decades. exact about my trouble. You’re wonderful! Thanks! It’s actually a nice and useful piece of info. I am glad that you just shared this helpful information with us. Truly no matter if someone doesn’t know after that its up to other people that they will assist, so here it occurs. put up extraordinary. Magnificent activity!